We know from the previous sections that Bigshot uses mechanical components (such as gears) to generate power, optical components (such as lenses) to form an image, and a display (LCD) to show captured photos to the user. 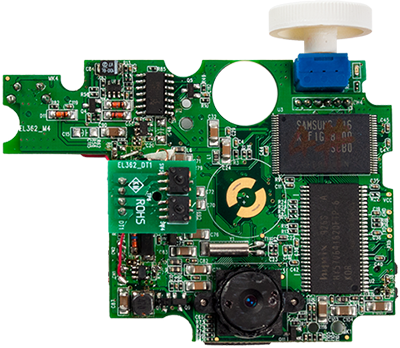 However, to measure, compress and store images, as well as provide visual and auditory feedback to the user, Bigshot relies on a set of electronic components. These components are mounted on a green printed circuit board (PCB) , as shown in Figure 1. The PCB has built-in wiring that connects the various components and allows them to communicate with each other. Let's take a closer look at some of Bigshot's main electronic parts. "Printed Circuit Board," Oct 2, 2009. [Online]. Available: http://en.wikipedia.org/wiki/Printed_circuit_board. [Accessed: Oct 4, 2009].